Mourners at the funeral service for DeEbony Groves, 21, said she sang the gospel tune “Jesus Loves Me” with a friend right when shooting suspect Travis Reinking, 29, allegedly opened fire at the restaurant on April 22, the Tennessean reported. Groves, who was a senior at Belmont University, had been out with her Delta Sigma Theta sorority sisters before deciding to go to the Waffle House in Antioch, where the gunman fatally shot her and three others. Ehmer and other speakers talked about her smile and her dedication to the Christian faith. Groves had been a few weeks away from completing her bachelor’s degree in social work. 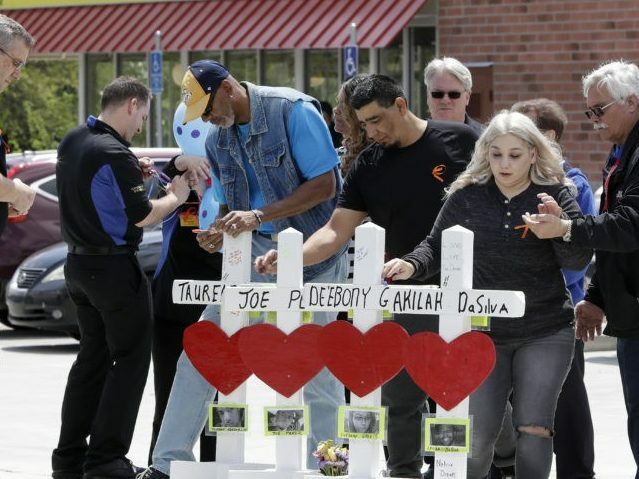 “If you look around you, her life speaks for itself,” said Juan Rodriguez, the pastor of Grace Tabernacle Christian Center, where Groves attended church. Authorities charged Reinking with four counts of criminal homicide in connection with the shooting. Reinking also faces four counts of attempted homicide and one count of unlawful firearm possession while committing a dangerous felony.